We specialize in comprehensive and cosmetic dental care in the Orlando – Dr. Phillips area, taking pride in offering the finest in patient care and services to each patient. We are determined to give you the smile you’ve always wanted! In fact, some of the most beautiful smiles in the fashion and entertainment industry come through our doors. We specialize in advanced dental procedures and use cutting-edge materials that provide patients with a healthier, more complete smile that can last a lifetime. 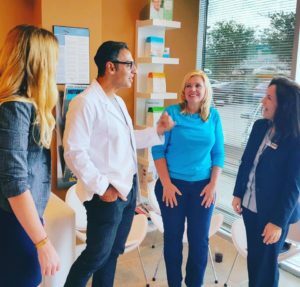 Your Orlando Florida dentist, Dr. Rayan, is known to revitalize and maintain your teeth and gums, giving you the smile you’ve always wanted. We know how important having a beautiful smile that accurately represents your inner beauty and personality is to our patients. The Smiles Forever team is focused on giving you a smile that will reflect your beauty while providing quality treatment with impeccable detail. Dr. Rayan provides expert level proficiency to one of the newest innovations to cosmetic dentistry, Facial Aesthetics. By combining his mastery of dental science and facial anatomy with the newest advancements in facial aesthetic services Dr. Rayan is able to accent and highlight unique attributes of an individual to accurately showcase a beautiful smile. We love welcoming new smiles to our Smiles Forever Family. Which is why we offer a $79 New Patient special which includes digital X-rays, a comprehensive oral exam, and a cleaning*.